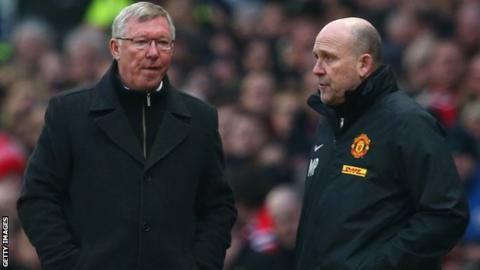 Norwich City have appointed former Manchester United assistant manager Mike Phelan as first-team coach. The 52-year-old was assistant to Sir Alex Ferguson for five years until the Scot's retirement in 2013. Phelan, who won three Premier League titles and the Champions League during his time as Ferguson's assistant, made 194 appearances in four years as a player with the Canaries. He was also assistant to Gary Megson at Norwich during the 1995-96 season. "It was important for us to try and get the best coach we could," Neil Adams told BBC Radio Norfolk. "I think Mike's record and experience speak for themselves. I've worked with him here. "He'll be working with myself, Gary Holt (first-team coach) and Tony Parkes (goalkeeper coach) out on the grass on a daily basis. "He is not a director of football or anything like that - he is a first-team coach." The former midfielder, who also won two League Cups and the Club World Cup while on the Manchester United backroom staff, has not had a coaching job since leaving the Red Devils following David Moyes' appointment as manager. "I am delighted to have the opportunity to return to Carrow Road," Phelan told the club website. "I have many fond memories and am looking forward to helping Neil and the team to progress and ultimately getting back into the Premier League where they deserve to be."